Dental crowns are a type of restoration used in cases of structural damage or tooth decay. Also known as “caps,” dental crowns are placed over compromised teeth to give them support and restore normal chewing function and appearance. Dr. Samir Ayoub uses dental crowns when patients have bad tooth decay and damage and need a dependable replacement. The first step of crowns treatment is the planning process. Dr. Ayoub will examine the damage to your tooth and diagnose the problem. This generally consists of a visual exam and possibly X-rays to look at the underlying tooth roots and bones. 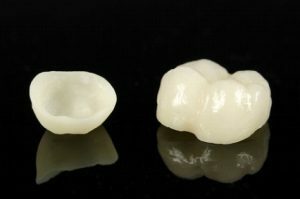 Using this information, Dr. Ayoub will determine the type and number of crowns needed and will create a treatment plan. Your crown may be crafted from porcelain, metal, porcelain-fused-to-metal or other materials; Dr. Ayoub will suggest the type he feels is best based on your specific circumstances. Before placing the crown, Dr. Ayoub will need to treat any conditions in the tooth (e.g., removing decay or performing a root canal) and prepare the tooth to accommodate the crown. Dr. Ayoub will take an impression of your tooth to send to the laboratory that constructs the crown. A temporary crown may be placed in the meantime; this gives you a preview of how your permanent crown will look and feel, and you can make any modifications if need be. While you wear the temporary, avoid eating sticky or chewy foods and be cautious as you floss to avoid accidentally damaging or removing the crown. It typically takes about two weeks for your permanent crown to be ready. You will return to the office and Dr. Ayoub will remove your temporary crown. The permanent crown will be bonded into place with a strong dental adhesive. Dr. Ayoub will buff and polish the crown and make any last-minute adjustments to ensure that it fits comfortably in your mouth and matches the surrounding teeth. 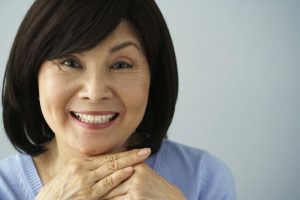 Crowns may be used on their own or combined with the placement of dental implants. If the damage to the tooth is so great that the entire tooth needs to be extracted, Dr. Ayoub may recommend placing a dental implant. The implant post is surgically placed in the jawbone, and a dental crown is affixed to the top of the post. This is a stable and long-term solution to restore normal chewing function and appearance. To learn more about dental crowns, schedule a consultation with San Francisco dentist Dr. Samir Ayoub. Contact our Union Square dental practice today by calling (415) 781-2227 to make your dental crown appointment.